Welcome to the Alternative Armies blog. 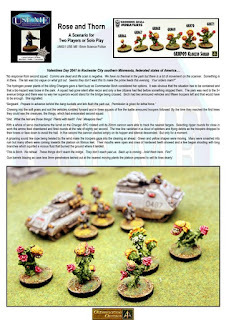 This blog tells you all about what we are up to and it is where we post our latest tabletop gaming news and articles. We cover Flintloque and Slaughterloo, High Fantasy, Other Ranges as well as our 15mm scale fantasy, science fiction and historical ranges. Our game systems and free content such as PDF downloads and reading articles. Enjoy and do dig back in time to see what was going on before now. Feel free to comment and ask questions. We are always happy to help gamers with their hobby. Now at Alternative Armies new infantry and a box set all for the SFA (Security Force Alpha) part of the HOF 15mm Science Fiction range. All in high quality grey tone resin these codes offer savings to build a core force for any game system. Each sprue has five different Human Infantry in armour and if you take five sprues it is just 10GBP for twenty five troops. The box set contains seventy five infantry, six vehicles, two towers with a massive 20% saving plus you can choose propulsion type on the vehicles. Go HERE for the HOF Range or read on for more. All across the core star systems and on Terra itself there is a need for security after, during and even before the high rollers and expensive kit arrives in the battle zone. 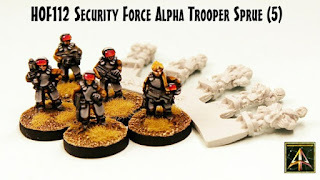 Security Force Alpha is just that force filling in as police, paramilitaries, mercenaries and planetary militias too. They are the faceless grunts that do the thankless jobs needed by all those who govern, control or enforce. Use them as you will from the near to the far future! 15mm Scale Resin Miniatures on a Sprue. 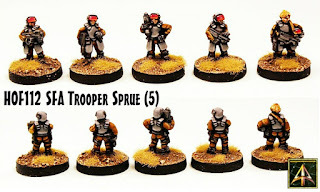 This code supplies five different Security Force Alpha (SFA) infantry troopers armed with projectile SMG's and wearing impact armour with full helmets; one bare headed on one 'sprue'. 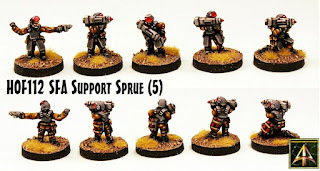 Choose from a sprue of five different 15mm resin miniatures or select five sprues for just 10GBP for 25 miniatures. Each sprue is one piece which will require the removal of the figures from it. This is done with ease with a sharp blade. See the sprue in the second image. Each Trooper is about 16mm tall in armour. 2.50GBP. Go HERE. 15mm Scale Resin Miniatures on a Sprue. This code supplies five different Security Force Alpha (SFA) infantry troopers armed with portable missile packs and spare rockets wearing impact armour with full helmets on one 'sprue'. 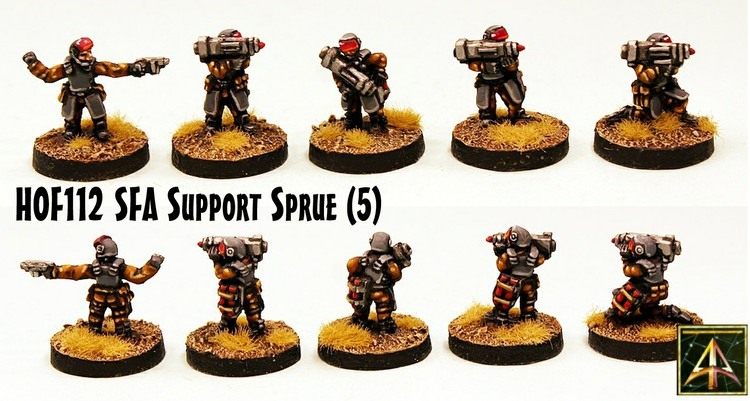 Choose from a sprue of five different 15mm resin miniatures or select five sprues for just 10GBP for 25 miniatures. Each sprue is one piece which will require the removal of the figures from it. This is done with ease with a sharp blade. See the sprue in the second image. Each Trooper is about 16mm tall in armour. Each Trooper is about 16mm tall in armour. 2.50GBP. Go HERE. Choose from a box set with mixed Chargers (Two Wheeled, Two Hover, Two Tracked) or a box set with six Wheeled Chargers, or a box with six Tracked Chargers, or a box with six Hover Chargers. Use the option choices on the website product screen. Each box saves 20% off the typical price of every item in the box giving you superb value in this all resin box. Price 62.00GBP (Value 77.50GBP). Go HERE. As you can see the new infantry are delivered to you as one piece which you then sub-divide into the component figures. We show them on our 20mm round resin bases and they look really nice! There are many other codes in Security Force Alpha for you to choose from. This low intensity warfare outfit is great for anything from near future to colonial worlds or fighting off hive minds. If you see anything you like just click on the links and remember you can get packs or parts of packs to tailor your collection. 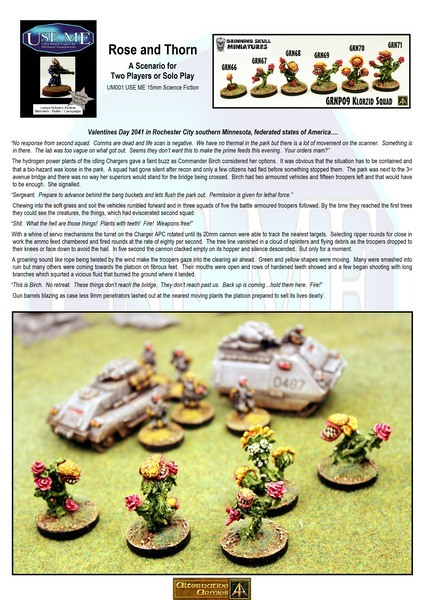 Plus if you missed it you can get a free scenario for USEME from Valentines Day on the blog HERE. Enjoy! This Weeks 10% off whole collection offers are our 28mm Terrain Range and the 15mm Loud Ninja Games range. Go HERE to see them both and check back weekly as offers each each Monday. Doom Squad solo rules released as a digital download! 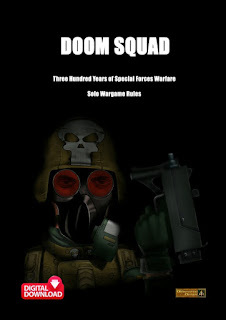 Doom Squad solo or co-op rules for 300 years of special forces warfare by Steve Danes released! Giant Spiders and Spider Swarm for any scale now released! Armoured Goblin Knights with separate weapons 28mm scale now released! 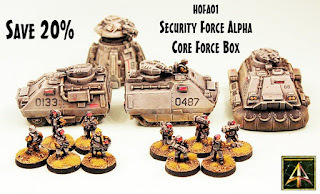 Now released in the HOF Range four new 15mm scale Battlesuits! 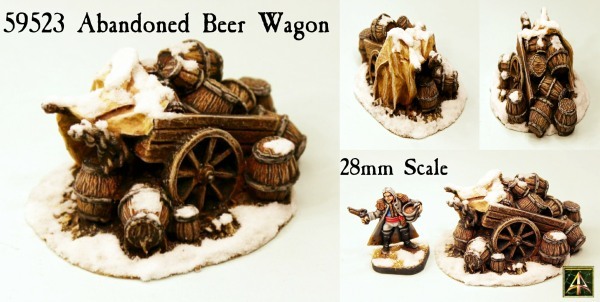 Library, Apothecary, Bed and Furniture 28mm Barricades plus Box Set of Eight released! VNT41 Stone Maw the Troll released!